We have really been slacking on the blog lately, but Steffi’s parents were in town visiting so we have a good excuse! Of course we did continue working on the house (and the neighborhood) while they were here. We have made some great progress in the garden. We enlarged our vegetable garden, came up with a garden plan, laid out a path, created some new flower beds, weeded the old flower beds, and started a compost pile. 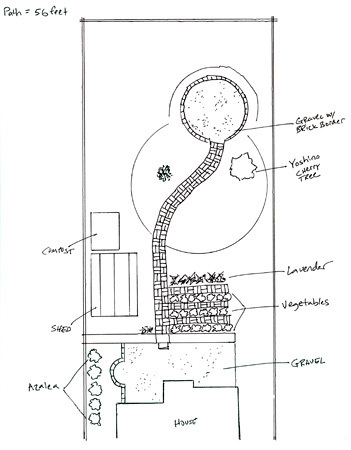 It took us a while to come up with the plan, but it really helps to have a clear vision of the garden. We also finally put up the Westview street toppers yesterday. We have been working on these since October (Steffi was the lead on the project), so it was very rewarding to finally see it all coming together. We had a small unveiling ceremony at Ontario Park, and then neighbors drove around with ladders installing them. 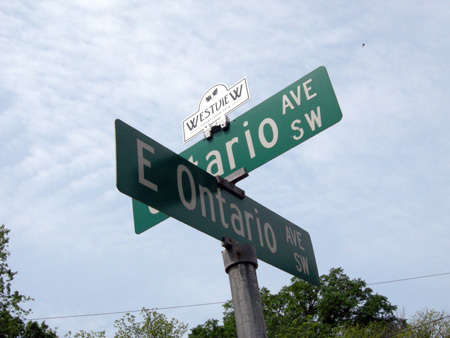 The street toppers are very important for Westview since people often think we are part of West End. Months of hard work finally paid off! Lastly, a couple weeks ago (when Steffi’s parents were visiting) we went to the Inman Park tour of homes. Inman Park is a beautiful old neighborhood on the east side of town, and it holds a lot of historical significance to Atlanta. Their tour of homes is always one of our favorites. As we walked up to house number six on the tour Steffi’s dad headed inside while we remained outside reading about the house in the handout they provide you. Her dad promptly returned with a huge grin and informed Steffi’s mother she was in for a big surprise! As it turned out Steffi’s younger sister had gone to school with the homeowner’s son. Surprise, surprise! They had recently built a traditional Austrian Weinkeller (wine cellar) in the basement using old bricks, so the conversation turned to where they acquired the bricks. I’ll pause the story here to explain why old bricks are significant. We have been looking for old weathered bricks since we bought the house. We want to tear up the front walkway, which is currently broken concrete, and replace it with brick. We specifically wanted old bricks to match the old house. New bricks just don’t have the same character. Unfortunately we haven’t had much luck. It seems that when a building is torn down these days a lot of the time the bricks are sold, recaptured, and then re-sold. Additionally, we don’t have many connections to the demolition industry in Atlanta, so we had no clue how to go about trying to ask for bricks that are headed landfill. This has been a very frustrating situation for us. Okay, so back to the story… Sandi told us she would have to check with her husband, but they had a pile of old bricks left over in the backyard from the construction of the wine cellar. Could it be true?! 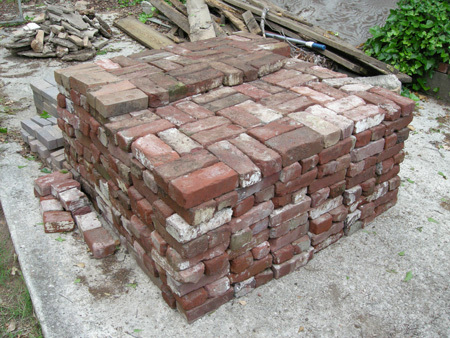 Had we finally found the elusive bricks we were looking for? We got her email and phone number and left with our fingers crossed. We waited for the weekend to be over since we knew they would be occupied with hundreds of people touring their home! Steffi sent a couple emails back and forth with Sandi, and finally the email we had been waiting for came through. She told us to come and get them!!! This morning our neighbor Carl from West End rang our doorbell bright and early (10:30am) and offered to help us with his truck. We made a trip over there and filled up the truck and the trunk of our car. Then we headed back to the house to drop them off. We probably were able to move at 1/3 of the bricks on this first trip. (THANKS FOR THE HELP CARL!) Steffi and I then returned four more times by ourselves and were able to move the remaining bricks in our car. In the end when we stacked them up they look like a palette of bricks. Lucky for us it seems as if it is going to be exactly the number of bricks we need for the front path. Hooray! So we have to say a MASSIVE THANK YOU TO SANDI AND KEVIN for giving us the bricks!! It means more to us than we can really express in words. 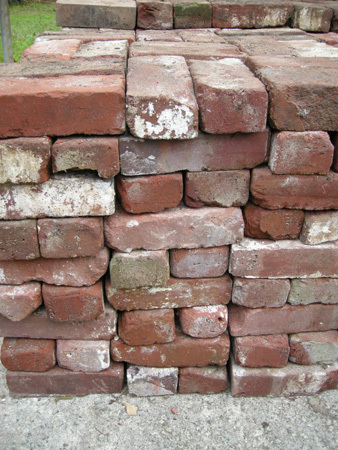 They also put a lot of hard work into removing the mortar from the bricks, and we know that is no easy task. THANK YOU! THANK YOU! THANK YOU SO MUCH! 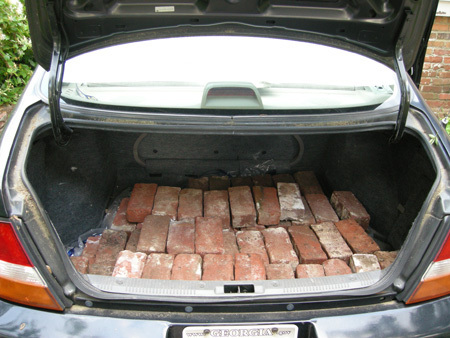 We had a lowrider with all those bricks in the trunk. 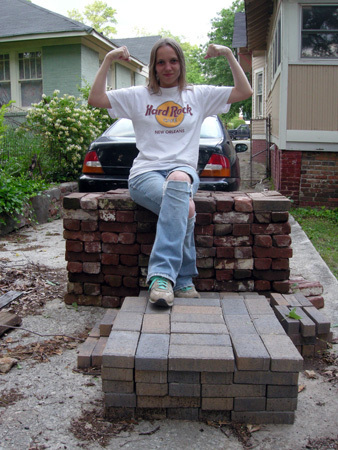 A girl and her bricks have never been so happy! Check out the beautiful old bricks! Posted in Gardening, General, Our Bungalow, Our Neighborhood | Tagged bricks, front yard, garden plan, gardening, historic bricks, old bricks, path, planning, salvaged bricks, sketching, southwest atlanta, street sign, street topper, west end, westview, westview bungalow | Comments Off on We’ve been busy, busy, busy!